According to the World Health Organization, depression is considered a worldwide epidemic, affecting about 5% of the global population. Depression is a mental illness that is defined by feelings of sadness, emptiness, or hopelessness. It can range from mild to severe and interfere with daily life. It is most common during menopause due to hormonal fluctuations. Depression is typically caused by a combination of genetic, environmental, and psychological factors. It's crucial to be aware of the symptoms of depression and to seek professional treatment if you think you are suffering from severe depression. Hormone fluctuations experienced during menopause are often involved in the onset of depression in women. Estrogen significantly affects the brain's regulation of mood and emotions. Consequently, women going through the menopause transition are at higher risk of developing depression because their estrogen levels considerably drop. Other possible causes of menopausal depression are genetics, chemical imbalance, stress, and lifestyle factors. Researchers have found that people who are suffering from depression show differences in brain images compared to those who do not suffer from depression. The parts of the brain that manage mood, thoughts, sleep, appetite, and behavior do not have the right balance of neurotransmitters. It is important to be self-aware and be able to recognize the signs of depression in order to catch it early on and get properly treated. Symptoms of depression can be divided into two types, physical and emotional. 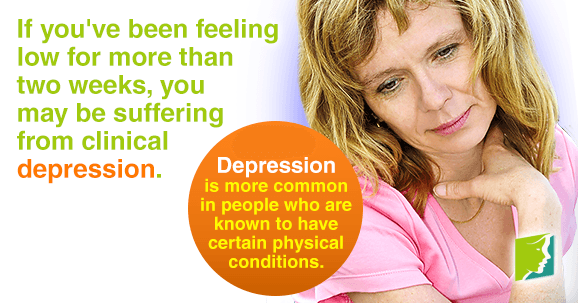 Depression is more common in people who are known to have certain physical conditions. If you've been feeling low for more than two weeks, you may be suffering from clinical depression. It's important to seek help from a therapist if you think you may be depressed. A doctor will help determine what type of depression you have, and then figure out the best treatment option for you, whether it be therapy, prescribing antidepressants, or a combination of both. It is crucial to seek proper treatment if you think you are suffering from depression. Talking to friends and family about what you are experiencing can help ease some symptoms of depression and allow them to understand your condition. Exercising regularly and eating healthy can also significantly lift your mood, improve sleep, and lower stress. Exercising helps release mood-regulating neurotransmitters in your brain (i.e., endorphins and serotonin). Eating healthy can help reduce depression symptoms like fatigue and headaches. Menopausal depression is typically caused by hormonal fluctuations, but can also be triggered by genetics, sedentary lifestyle, and high stress. It is vital to seek treatment as soon as possible if you think you are suffering from depression. Mental healthcare professionals will be able to determine what kind of treatment is right for you. Exercising regularly, eating healthy, and talking with friends and family can also help ease menopausal depression.